Some conventional-powered submarines(Golf, Ming, Romeo, and Wuhan) are regiment deputy leader-grade organizations and are directly subordinate to a regiment leader-grade submarine dadui, which is subordinate to a submarine zhidui. The primary rank for the submarine CO and political commissar is commander. 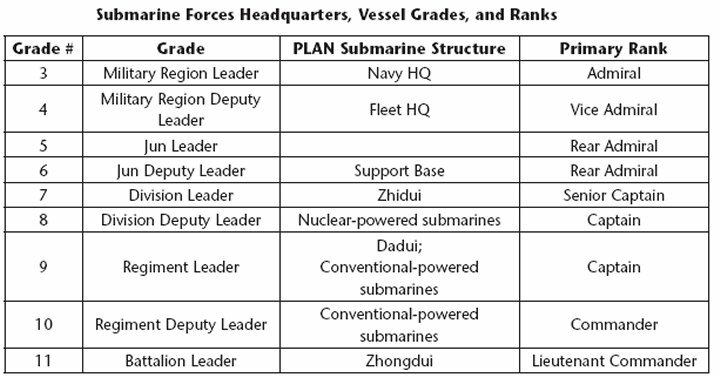 Some conventional-powered submarines (Kilo, Song, and Yuan) are regiment leader-grade organizations and are directly subordinate to a submarine zhidui. The primary rank for the submarine CO and political commissar is captain. Nuclear-powered submarines are division deputy leader-grade organizations and are subordinate to division leader-grade submarine zhidui. The primary rank for the submarine CO and political commissar is captain. 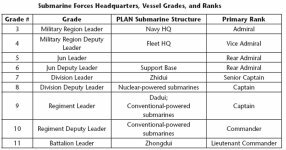 Each submarine zhidui is, in turn, subordinate to a jun deputy leader-grade support base. The primary rank for the support base commander and political commissar is rear admiral. Each submarine zhidui may also have a subordinate service ship zhongdui and an auxiliary ship zhongdui. Each vessel has its own grade, depending on the size and function. Nuclear-powered submarines each have more than one crew, compared to one crew for each conventional-powered submarine.